If you’re a Pokémon fan then you’ll no doubt be aware of the very first episode of the anime series: Pokémon, I Choose You!This is the episode where the unbreakable bond between Ash and Pikachu began. Now, 20 years later, the story has been remade for the 20th movie of this huge franchise. Does this new take on a classic story capture the wonder of the Pokémon world? This movie acts as an alternative universe retelling of Ash and Pikachu’s classic encounter. Like in the original anime episode, the movie starts off with Ash oversleeping and getting to Professor Oak’s lab late – dashing his chances to choose one of the three typical Kanto starter Pokémon: Bulbasaur, Charmander or Squirtle. 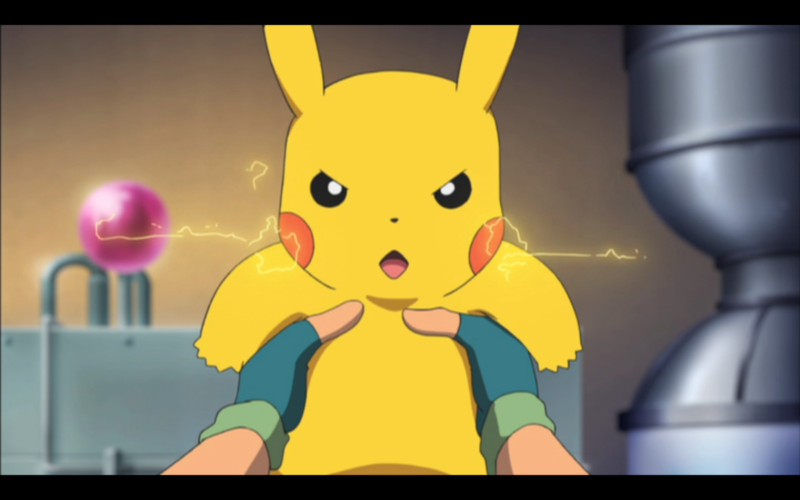 Thankfully, the professor has just one Pokémon left: an electric mouse known as Pikachu. While Ash and Pikachu don’t get on well to begin with, Ash eventually saves the small Pokémon’s life from a flock of Spearow and then the two form an unbreakable bond. As the sun rises after their life-threatening encounter, Ash sees a rainbow form in the distance and a mysterious Pokémon flies overhead which drops a rainbow-coloured feather. With the feather in hand, Ash and Pikachu vow to one day meet this Pokémon together. It turns out that chosen trainers are given a Rainbow Feather by the legendary bird Pokémon Ho-Oh in order to guide them to its location. 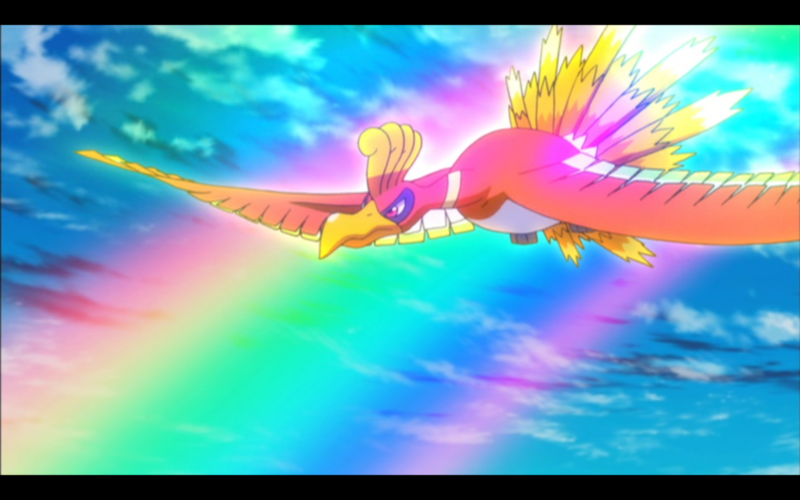 The one who follows the feather will become the “Rainbow Hero” and be able to challenge Ho-Oh to a battle. With this in mind, Ash and Pikachu set out on what could be their greatest adventure yet. 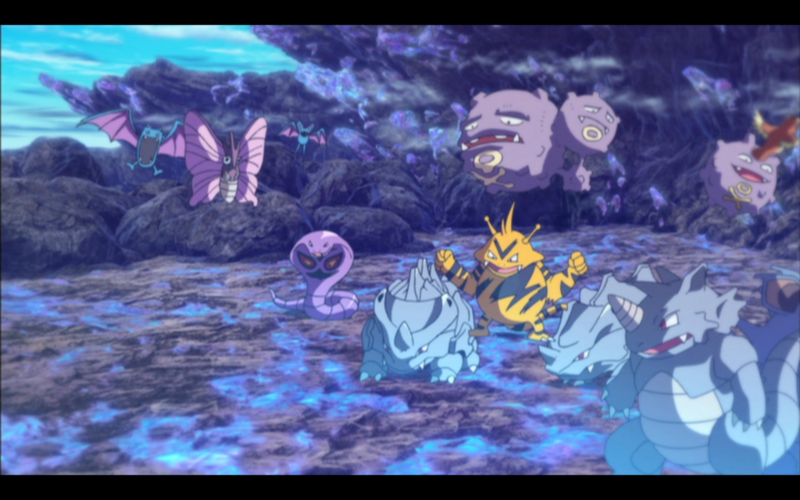 Pokémon the Movie: I Choose You brings this tale back to a much simpler plot than those we’ve seen in the Pokémon movies recently, and rebooting the series in an alternate universe means you remove many of the hurdles the movies would normally have. For example, rather than Ash travelling with companions from the TV series, Verity and Sorrel are completely new characters for the movie. Ash also doesn’t have a lot of Pokémon within the movie, and this works much better in terms of developing his relationship with Pikachu. The drawback in introducing new characters, of course, is that a movie simply doesn’t always have time to develop everyone. This is true for Verity and Sorrel. Both of them were given what could have been interesting backstories but they’re never elaborated on and, for the most part, pushed aside. It’s a huge shame because although the two aren’t bad characters, they feel like bystanders to Ash and Pikachu’s adventure. It’s one of the biggest issues I have with this movie – but that’s not the only one. On top of Verity and Sorrel’s situation, I also have to point out that one of the movie’s lead Pokémon, Marshadow, really doesn’t feel like it needed to be included. Within the context of the story it’s said that Marshadow watches over those chosen by Ho-Oh and puts them through a test to see if they’re really worthy of meeting the legendary Pokémon. The problem is that Marshadow’s role could have been handled by Ho-Oh or the other Pokémon featured in the movie. The truth of the matter is that Marshadow is shoehorned in because it’s the latest special Pokémon to be given away for the current games, Pokémon Sun and Pokémon Moon. 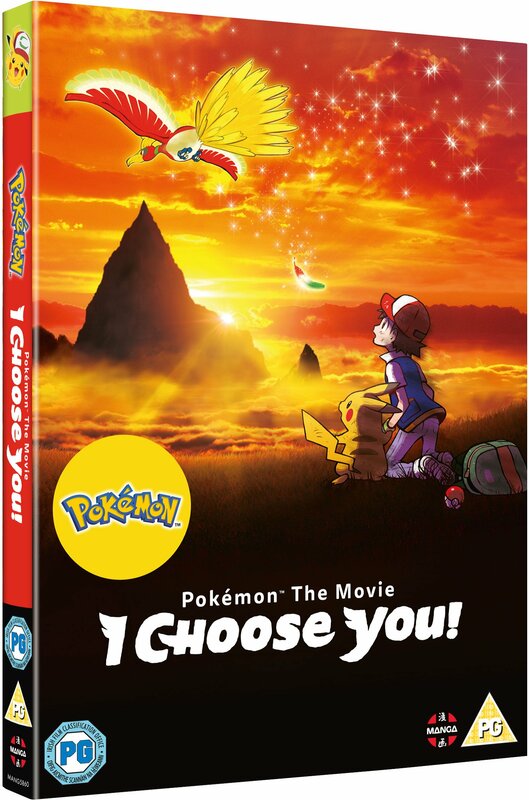 Its inclusion just reminds me that the Pokémon films on a whole are just glorified adverts for the games, and without Marshadow, Pokémon the Movie: I Choose You probably would have held together better. That’s not to say that the 20th Pokémon movie is a bad film though – because it’s not. In fact, I’d go as far to say that this is the best Pokémon movie in a very long time and a real return to form. 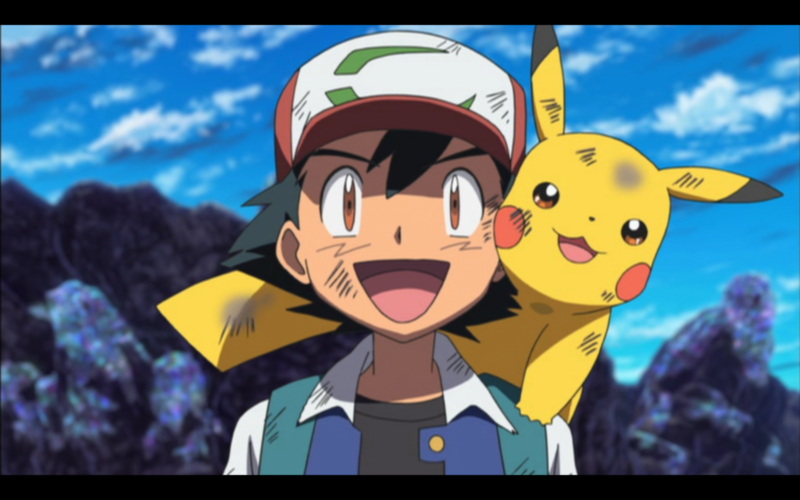 The relationship between Ash and Pikachu is emotional and the overall plot does a good job of tugging at the viewer’s heartstrings. This really does feel like a fitting tribute to the original series and I came away really happy with what I’d watched. It’s instantly a Pokémon movie that I’d watch again and I haven’t had this feeling toward a Pokémon adventure in a long time. Where animation is concerned, the movie has been handled by OLM, the studio that usually works on Pokémon. 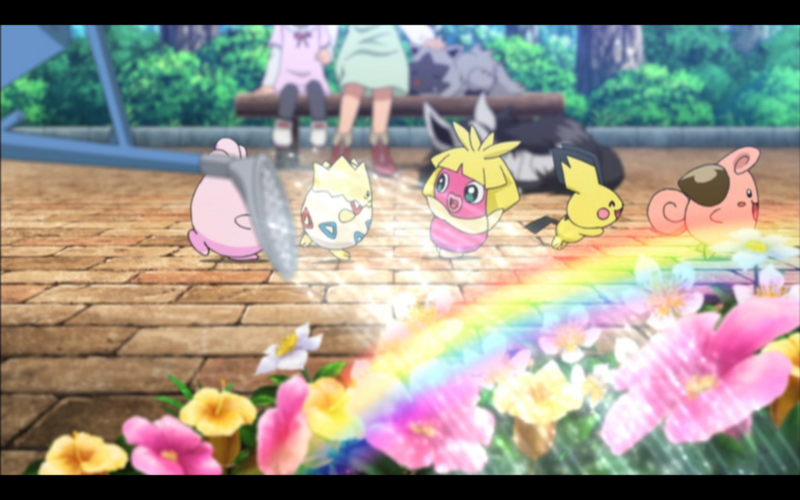 The movie is bright and colourful, filled with some fantastic scenes of Ash and Pikachu running through lush forests and flower-filled fields. The only real complaint is some clunky CGI used earlier on in the movie. It’s a bit weird, as the CGI is terrible to begin with but blends in much better later on, so I wonder why they didn’t go back and fix it for the beginning. As is traditional for the Pokémon anime and movies, the majority of the original Japanese soundtrack has been removed for the dub. This leaves me unable to talk about the composer to great length as I’m not sure what is left intact and what has been replaced. What is here serves as a decent soundtrack, made up of mostly jaunty piano pieces. However, there is also a new rendition of the original opening theme, “Pokémon Theme (Gotta Catch ‘Em All)”, which will no doubt have veteran fans singing along. The voice actors do a good job overall, especially Sarah Natochenny (Stephanie in Yu-Gi-Oh! 5D’s) who plays Ash for the movie. She plays the role with a lot of emotion for Ash, which is critical considering how much of the movie hinges on the bond between Ash and Pikachu. Although no one else in the dub really stands out (owing mostly to a lack of characters) it certainly isn’t bad and I’d happily watch the movie dubbed again. This release comes to the UK thanks to Manga Entertainment and is currently DVD only with a Blu-ray release set to follow on the 30th of April. Like all Pokémon releases outside of Japan, this set contains only an English dub with optional hard of hearing subtitles. Sadly, there are no on-disc extras to speak of. This is a shame as there were some fun shorts shown during the theatrical showing last year. However, at the time of writing it has been confirmed that the movie will come bundled with a DVD featuring the very first Pokémon movie. If you’d like to know more about it then you can read my review of that movie here. This extra is exclusive to the DVD release and will not be bundled with the Blu-ray in the future. Overall I think Pokémon the Movie: I Choose You is a real treat for fans of the series. While there are certainly issues that bring it down somewhat, these can be overlooked. I think both new and old fans of Ash and Pikachu’s adventures will have a blast here. Undoubtedly this is one of the best Pokémon movies in quite some time. Overall Pokémon: Partner Up with Pikachu! brings together some of Pikachu’s most meaningful adventures from the anime’s first season.